State and local leaders joined with activists at the launch of a campaign to change payday laws in Missouri and nationwide. The event was hosted by Communities Creating Opportunities (CCO). Payday loans sap roughly $26 million dollars a year from the Kansas City economy according to a figure from the Center for Responsible Lending. Mayor Sly James says this needs to change. “There are more payday loan shops in Missouri than Walmarts, McDonalds, and Starbucks combined,” says Mayor Sly James. John Miller, a leader with CCO, says the campaign is aimed at getting next year’s Missouri General Assembly to cap interest rates for payday loans at 36 percent. They will be meeting with elected officials and organizing events to spread the word. “Once upon a time, we had rules, the industry was allowed by our legislature to change those rules, but we can change the rules again,” says John Miller. The campaign also supports proposed regulations in The Federal Consumer Financial Protection Bureau that would place tighter restrictions on payday loan companies such as requiring lenders to evaluate the ability of consumers to pay, and placing limits on the amount they can lend. A decision on those regulations is expected later this year. The launch event was sponsored by DollarWise-Mayors for Financial Literacy. The initiative from the United States Conference of Mayors seeks to educate on matters of financial education. 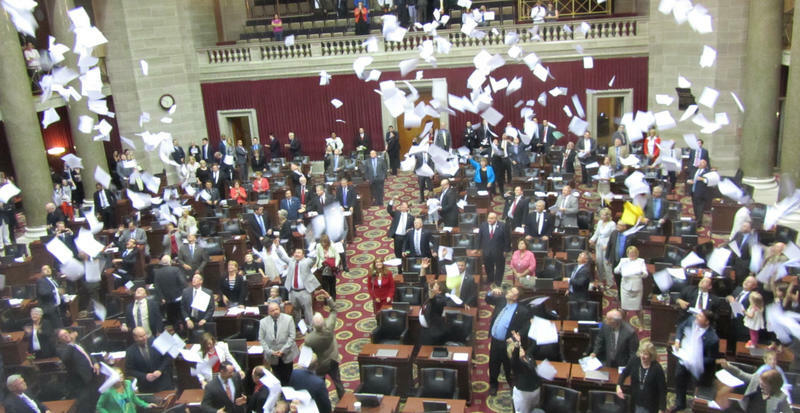 Only one major piece of legislation passed the Missouri General Assembly during its final day of the 2015 session, capping a surreal and strange week that saw the House speaker resign and the Senate paralyzed. After days of delay, both chambers found time Friday to swiftly approve a must-pass bill necessary for the state to accept its annual $3.5 billion in federal money to pay for the existing Medicaid program and related health care expenses. Updated 5 p.m., Wed., May 6 -- Missouri Gov. Jay Nixon had harsh words for the General Assembly’s action to override his veto of a bill that shortens the period for low-income families to receive welfare benefits. The bill also imposes new work requirements. During a stop in St. Louis, the governor said he didn't object to changing the work requirements. But he did object to the way it was done, which his administration says will result in about 6,500 children getting knocked off the state's welfare rolls. "You don't move the state forward by taking benefits away from 6,500 kids,'' Nixon said. He explained that there were ways, such as a "protected payee program" that would have penalized the parents, but not the children. "What did a 5-year-old do wrong?" he asked. "There were a lot of ways where kids didn't have to suffer here."